Without further adieu though please see below for the new covers for Zoe’s books, The Night Itself and Darkness Hidden, books one and two in The Name of The Blade Trilogy. I honestly think they are beautiful and I teared up when I saw them, the colours and the imagery are exactly right for the story (at least for the first book which I read last year) and I am so excited to read the rest of this series! 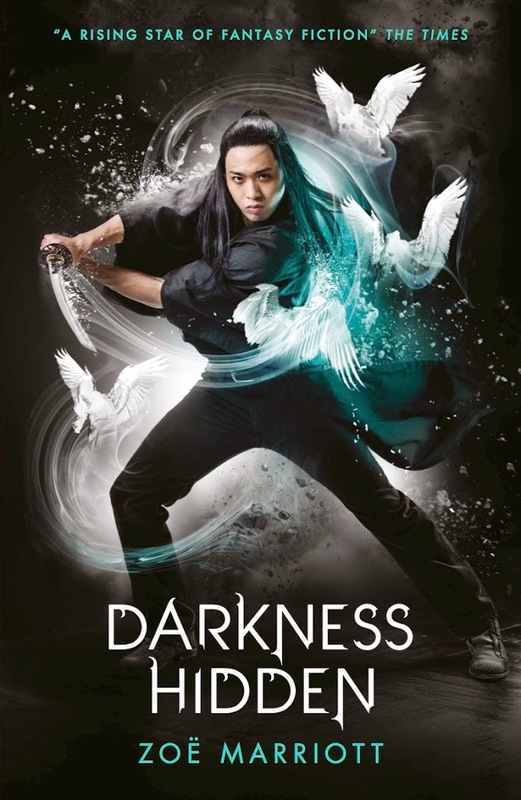 You can also read my Q & A and part of the extract from Darkness Hidden. Question: What inspires you to write; do there tend to be specific events happen which begin your writing thought process or do you get an image in your mind of what/who it is you want to write about? Answer: For me, it varies quite widely from book to book, but the thing that always tends to happen is that two or three ideas that have been sitting in the back of my head for a while – a character, a setting, a certain plot twist – will suddenly collide in a way that makes each of them suddenly come to life. And then the character will start talking to me. No, really. Usually they speak the first line of the story in this kind of: ‘Ahem! Pay attention stupid author!’ way, and I rush about trying to find a pen to write it down, because if I forget, I’ve just killed the whole thing right there. The Name of the Blade was a bit different because it almost came out of nowhere. I wasn’t thinking about writing an urban fantasy series, I hadn’t been letting any ideas marinade in the back of my brain. But a friend of mine in my writing group had been talking about a poem called The Bedpost (by Robert Graves) which is about this legendary warrior who falls afoul of a witch, and is turned into a post of wood, and becomes part of a bed. His only hope of freedom is to get the girl who sleeps in the bed to fall in love with him by whispering stories to her at night. But sadly for him she’s more into the gory sword fighting stories than the romantic ones, and the poem ends with him still trapped. I immediately thought ‘Jeez, someone ought to give that story a more satisfying ending…’ but I couldn’t imagine writing a book in which the hero was trapped in a post of wood. What if he was trapped in some piece of his own warrior’s equipment? Like a shield or an axe or… a sword? And the instant the idea of a sword came to me, it was like my brain exploded and I could see it all. It would be a katana. The warrior would be a young Samurai. The book – no, BOOKS! – would be set in contemporary London. The heroine… etc. etc. Looking back now I can see where a lot of those choices came from but at the time it honestly felt like the universe was downloading all of this directly into my brain. It was a real ‘wow’ moment! In other words: Get lost, humans. Fine by me. Then I saw Jack and Rachel heading down the green terraces towards us – and Rachel was walking under her own power, without hanging onto Jack. Long, damp hair fell around her face in thick curls that the world never usually got to see. There was a faint flush in her golden-brown cheeks, and the blank stare from earlier was gone. She looked better than Jack, even, since Jack still had a black eye. Relief brought a huge grin to my face. The fox spirits’ medicine and music had done an amazing job. “Hiya She-Ra!” Jack called cheerily, dodging around a couple of giggling Kitsune. The words choked off as the sight of Rachel’s neck hit me like a hammer to the gut. The Kitsune had given her some dark trousers and a clean white shirt. The last time I saw her, the shirt had been buttoned up to her throat – but Rachel had undone some of the buttons now, and the open collar revealed a horrifying wound on her neck. A ragged circle of deep puncture marks and torn, puffy skin. It was the size of a dinner plate. Nekomata were blood drinkers – that was how they stole people’s shapes and memories. The monster had Rachel all to itself in its lair for hours before we finally turned up to rescue her. It had used her like a cat toy in its sick game. Jack aimed a glare at me over her sister’s shoulder. This is not about you, Mio. Get it together! “We could all probably use some real sleep,” Jack said, a shade too loudly. She gave Hikaru an apologetic look. “Oh, for God’s sake,” Rachel muttered. She turned away in apparent disgust, but the vulnerable shape of her back as she hunched over her folded arms sent a sharp stab of guilt and sadness through me. I stepped towards her – not sure if I could repair the damage I’d already caused, but determined to try – and bumped into Shinobu. We both stared awkwardly at the space between us. This kept happening. It was like we’d forgotten how to be easy with each other. Every time I thought we’d got that sense of – of rightness back, it vanished and left me closing my hands on smoke. Before I could reach out to either Rachel or Shinobu, or just fall on the floor and have a screaming tantrum – which was pretty tempting at that point – a familiar voice said my name. It was Araki, the king’s archer and personal servant. She stood beckoning to us at the base of the king’s throne in her human form. The king himself was still nowhere to be seen. Wow, those new covers look absolutely stunning!